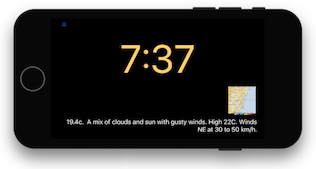 iOS app which implements a clock radio. Uses Flic bluetooth buttons for control. Features album art fetched from the iTunes store and weather. FileInsight displays information on disks and files and live file system activity. It displays paths, sizes, dates, types, tags, extended attributes (names and hex display), volume capabilities, totals, manufactures, URLs, UUIDs, IOKit paths, file hex display (first and last 25k) and file hashes (MD4, MD5, SHA1, SHA224, SHA256, SHA384, SHA512, RMD160). I use a keyboard that lacks any multimedia media keys (volume up, volume down, mute, eject). Since OS X doesn’t allow you to remap existing keys as media keys I wrote MediaKeys to allow you to do just that. BTW, You must leave the software running for the remapping to occur!. Getting video into iTunes can often be a time consuming and fiddly process. I wrote this GUI frontend for HandbreakCLI to solve that. “one click” drag and drop conversion. Automatically add media to iTunes. Automatic conversion of downloaded videos (compatible with Safari and Transmission). A simple System Profiler style GUI around Apple's FSMegaInfo sample code command line tool. Apple's code can be found here..
v1.2 Added "FSGetVolumeInfo" and some "getattrlist" volume info. Picture Frame No longer updated.